The July 19th Scanfish survey in Chespeake Bay. OK, not the most scientific title, but it certainly describes the deep water out here. 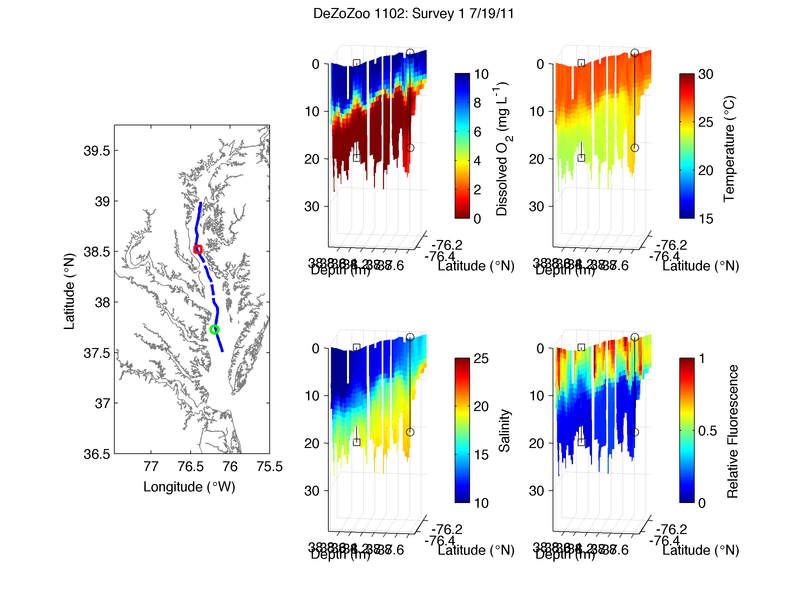 The low oxygen water extend the entire length of our transect, from the Bay Bridge all the way down to the Rappahannock Shoals (see figure). That in itself is not entirely unexpected, though the fact that it is really, truly zero for almost that entire distance is pretty interesting to me. I am not a data historian for the Bay, but for most of the data I’ve looked at from the last 15 years, I’ve not seen zero, nil, nada, oxygen extending this far south. That certainly doesn’t mean it didn’t happen, but our original plan had been to use this southern station as an “oxic control”, to compare with our more northern section. That won’t be possible this cruise, because we couldn’t really afford the time and effort of driving around the bay and poking holes in the water to see what it smells like. We will have some interesting contrasts between the stations on this cruise I think. Temperature stratification is slightly different between our two stations, as is salinity. But I think one big difference will be the zooplankton predators. We’re catching quite a few Ctenophores out here – comb jellies – and at last look there weren’t many in the Choptank River near our northern station. This could be a good opportunity to do a comparison between hypoxic/anoxic stations with different predators to really address the question of what controls the copepod populations in the summer: is it the low oxygen water or the predators. More on that another time. One other interesting thing about the Scanfish data I plotted up is that there is a hint of more oxygenated water at the bottom than in the middle of the water column. This shows up in our CTD casts we’re doing hourly while out here. I think it suggests that there is oxygenated deep water coming in over the Rappahannock shoals from offshore, and it’s mixing with the anoxic water to produce strongly hypoxic, but not anoxic deep water. This causes the lowest oxygen water to occur in the mid depths, a condition often called and OMZ – oxygen minimum zone – when it’s observed in deeper waters offshore and in enclose seas like the Black Sea. It could make for some interesting dynamics; there may be very different communities in the deep water that are stressed because of the low oxygen, and that want to move up towards oxygenated water but run into this anoxic water above them. I’m speculating, but it has certainly been seen in deeper systems with OMZs. A quick note about the equipment: Most of my blog posts contain some misery about equipment failures, but so far we’ve had good success with the instruments on board. The RV Sharp technical teams found water in the cable we use to tow the Scanfish and MOCNESS, and they traced it back 100 m up the cable, so they cut that all off, reterminated it, and so far so good. We’ve a lot of science yet to accomplish but things are moving well so far. A quick note about people: We have a lot of green folks out here on this trip, and I don’t mean environmentally friendly (though they may be that too), or seasick (which they are definitely not considering the hot but spectacularly calm weather we’ve got at the moment). This summer we’re partnering with COSEE Coastal Trends to develop some curricular materials related to the types of science we’re doing, and to make this successful we’ve got two undergrads from Hampton University and two teachers (one from Rockville, MD and the other from Texas) who are making this happen with some input from me and a lot of guidance from our grad student and postdoc. I’ll try to get some guest blog postings from them, so be on the look out for exciting new perspectives. We’ve also got a visitor from East Carolina University and an REU student, not to mention a summer intern from our local community out here. It makes for a more crowded ship than we’re used to but there’s plenty of ice cream and it’s a phenomenal team to work with. Speaking of, they’re out on deck sweating while I’m blogging away in the cool conference room of the ship.